There are no more in-store Starbucks paper receipts with survey invitations. This summer, the in-store survey invitations changed to be a survey with no incentive to do it all. (Customers noticed the missing survey incentive, and asked for the incentive back on MyStarbucksIdea.com) In 2012, Starbucks switched to in-store receipts that offered one dollar off your next purchase. Before that, your survey receipt was worth one free tall hand-crafted beverage. And long before that, your survey receipt allowed you to enter into giveaways for money prizes. All the old invitations-on-in-store-receipts are a thing of the past now. The new e-mailed surveys are major overhaul from what the old invitations-on-receipts ones were like: You now get a one “star” for doing the survey. If you’re part of My Starbucks Rewards, the “star” will be credited to your account within three days of doing the survey. There are far fewer questions. There are no demographic questions asking about income, age bracket, or even how many times a month you go to Starbucks. There are fewer questions about what your experience was. There’s no area on the survey for a free form, opened ended response. You answer the questions on a scale of one to seven. The new surveys are very mobile phone responsive! You can easily do the survey within a couple of minutes from your phone. I’m so happy to be able to easily do the survey on my phone now! You couldn’t do that with the old version of the surveys. I can think of lots of pros and cons of this new survey system. On the plus side, it’s likely that many more people will take the time to fill them out, since they’re now shorter and more convenient to do, since you can easily do it on your phone. This is huge! And it’s nice that there’s now at least some incentive again for doing the survey. Lots of retailers offer some small incentive for doing a survey. 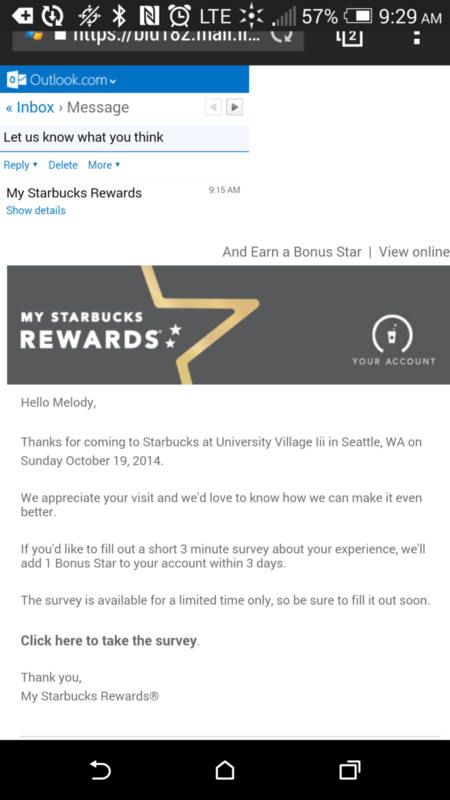 Having a “star” as a reward, reinforces the My Starbucks Rewards loyalty program. On the downside, there is no way to give any open-ended feedback on the store. There’s no blank box for you to write what you like: I’m a firm believer that open ended feedback is still a good thing. 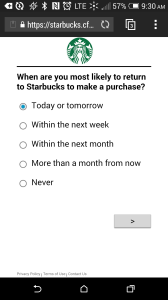 I also wonder how Starbucks collects demographic data without the survey questions. It is possible that some people will ignore the survey in their inbox (or it will go to their junk mail folder), as some people might assume that it’s spam. 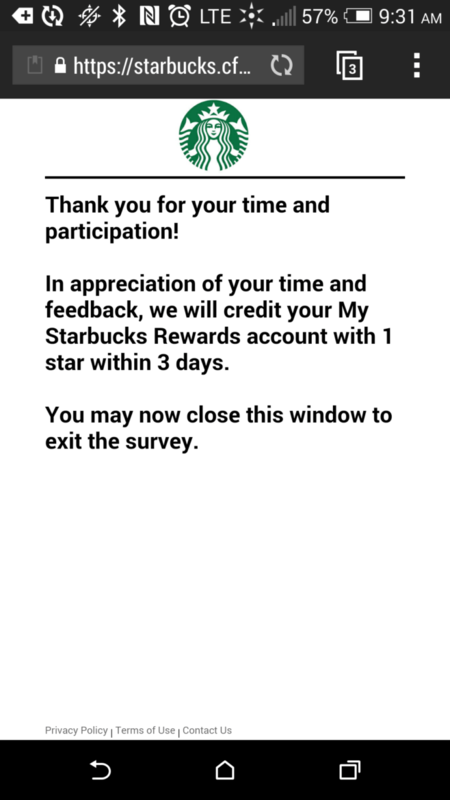 Since the surveys are now tied to My Starbucks Rewards, it seems like only My Starbucks Rewards members are doing surveys now. That seems like a skewed audience sample. 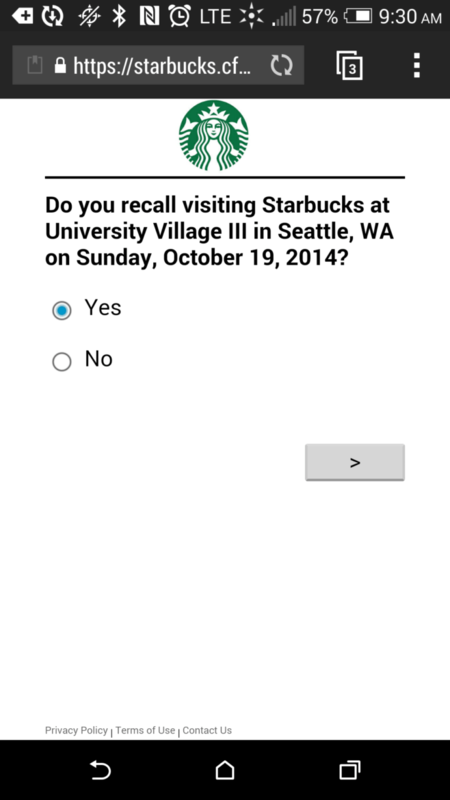 I think the new e-mailed surveys are a good move by Starbucks. More people will do the surveys since they’re shorter and easier to do! The difference in length in dramatic. Like before, only randomly selected individuals will receive surveys about their store visits. As an aside, I’d like to see Starbucks make more of a commitment to having the “Share Your Thoughts” pamphlets in every store (filled out with the district manager’s name on the pamphlet). Feedback is extremely valuable, regardless of how it’s collected. I’ve met many people in retail who think everything is fine if no customer has confronted him or her about something. It’s a false sense of security to assume that silence means approval. Some research suggests that half of unhappy customers stay quiet and say nothing. Other research is much more dramatic, suggesting that about 80% of those with an unhappy experience will say nothing at all. Hopefully, if Starbucks has many doors open to feedback (i.e.,surveys and “Share Your Thoughts” pamphlets) they’ll hear great feedback. But my only point here is the more feedback, the better. Interestingly, I’ve heard partners tell me that now they can do surveys for their own store. The new e-mail survey system can randomly select a store employee now! Have you gotten one of the new surveys? What do you think? Cane Sugar Cola at Starbucks? Move over Fizzio Root Beer! Coffee Education: Starbucks Hacienda Alsacia; Reserve Colombia El Penol; Geish La Ines; Anniversary Blend. Melody very timely post for me because a few weeks ago I got such a survey and thought it was not from SB. I did not answer the survey and deleted the email. I think to avoid this in the future SB should make customers aware that these emails are directly from SB. I asked partners at my local store about it before I deleted it and they knew nothing about it. Told me to call customer service. Nor do I remember if they mentioned getting a star. Wow. This sounds truly awful. I’ve been pretty bummed about the fact that they got rid of the dollar off for completing the survey earlier this year and I can’t believe the reward that they’re giving for completing a survey is just one star. I do welcome the “short and sweet” format and the convenience (email) of it, but you’re right Melody, I do think more formats are needed to better understaffed the whole customer service picture. Also, no free form means I can’t give a specific feedback regarding any issues or recognizing a partner who has done a particularly great job, and I think that’s a bad move. I’d rather take a bit longer and detailed survey with open ended box and receive a free drink or a baked item than this. Oh and partners being able to complete the survey of their own store ? Doesn’t that defeat the whole purpose of customer service survey due to possible bias? @Soon – I was surprised but a few friends on Facebook mentioned that they got surveys for their own stores. I would assume that somehow Starbucks will eventually figure how to prevent that from happening. @Purple1 – Yes, this is a risk that people are going to see the email and think it’s spam. And the store partners should know there’s a new customer survey system! I’m sorry they weren’t knowledgeable. I suspect that we’re going to see this new system tweaked here and there a bit over time. @Cecille – I do think that this survey system will go through some minor tweaks over time! And I love what you mentioned: You’re so right that it’s much more random, and baristas can’t toss out the surveys and/or hand them to someone it was not intended for. And there’s no wasted time trying to persuade a customer why it’s worthwhile! Really good points!!!! I got one of these surveys for my store (I’m a partner). I personally think it’s far easier than the previous method, it really did only take like two minutes! It also eliminates the partner’s knowledge of who will be getting a survey… in my opinion, that’s a good thing. But I can’t imagine how it would go to non-MSR members. If a non-MSR customer comes in, pays with cash, and leaves, there is no way to contact that customer by email. And often the non-MSR customers have good feedback, since they may have a different perspective or notice things that regulars wouldn’t. I also liked the open-ended comments; every now and then a customer calls out a specific partner for always being so friendly or for managing a situation well, and getting mentioned in a CV survey can make a partner’s week! Hopefully this is something they keep working on. With participation, it’s really an invaluable tool for customers to let stores know what they’re doing well and what they should be improving. @MistoGirl – Those are really good point! I know lots of partners who liked getting the feedback where they’re called out. So many good points. I can’t reply to all of your comment. Gotta run out the door to work, but just want to say thank you for writing that! The other downside is that only people who use their Starbucks Card will get a survey so Starbucks is missing an important portion of their customer base. This highlights another reason to ensure the information in your Starbucks Card account is correct and up-to-date. I can understand people trashing an email survey. 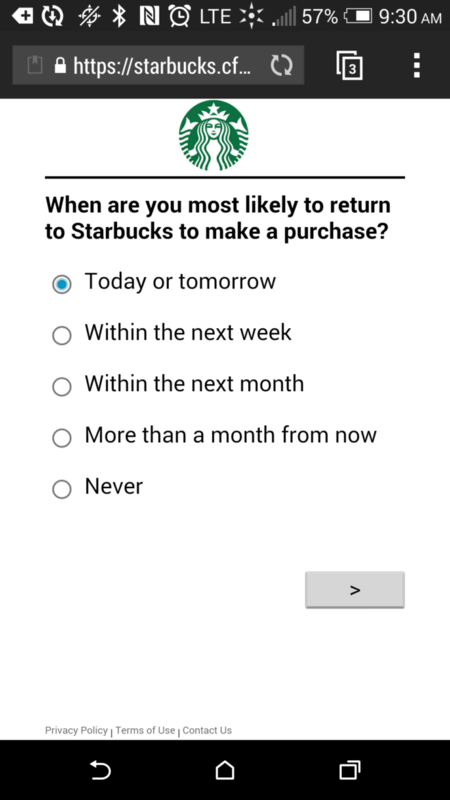 If these surveys come from an email address other than something like @survey.starbucks.com, cautious people are going to hit “spam” or delete. A common source of malware infections are emails that claim to be surveys, particularly ones that arrive unsolicited. Starbucks would be advised to, if you are to get a survey is to automatically print out a receipt that notifies the customer that they have been selected to complete a survey and to watch their email. Customer voice surveys were always a bit of a sticky wicket. Partners gamed them by giving them out to regulars, keeping them away from customers when they had an issue, and overall the number of responses were never large enough to provide an adequate sample size to have any real correlation to actual customer service in a particular store. I got my first new survey last week. If you look at my purchases, 19 of my last 20 visits are at the two closest stores to my house. My survey was for the one store I visited while on a 36 hour trip to visit my parents in my home town 200 miles away. Proof that randomness gets you random results. I think that this is a first step in improving the customers’ access to providing feedback about the store. Once all the stores have switched over to the new WiFi provider, I could see a tab to provide open-ended feedback about your current visit on the front page. That allows for automatic store detection, and combined with the ‘Share Your Thoughts’ brochures for more thoughtful / later feedback, would hopefully generate more, actionable comments. I find the questions asked are good (much better than the “skill” of the person making the beverage), but still do need defining. If you rate anything 5 or lower there should be a drop down question asking what could be improved. There is where a customer could have a better arena for comment. Any barista given a shout out by name on a customer voice used to get special recognition at our store. Maybe a special recognition space could be included. First of all, I really enjoy all the updates you have been consistently feed us with information. I am a Barista from Boca Raton Florida. I have been with Starbucks since 2006. I really miss the Snapshots Survey IN THE OLD DAYS. $1 survey is not as accurately as I think because some of our barista only give it to those happy and regular customers in order for the store to hit a 100% satisfaction. 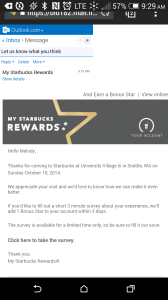 Ideally, I think the email SURVEY is not as good because Starbucks is only offer to those who carry Starbucks card. Well how about those do not have or doesn’t want to carry Starbucks card and they really want to complain or compliment? Hi, Melody! 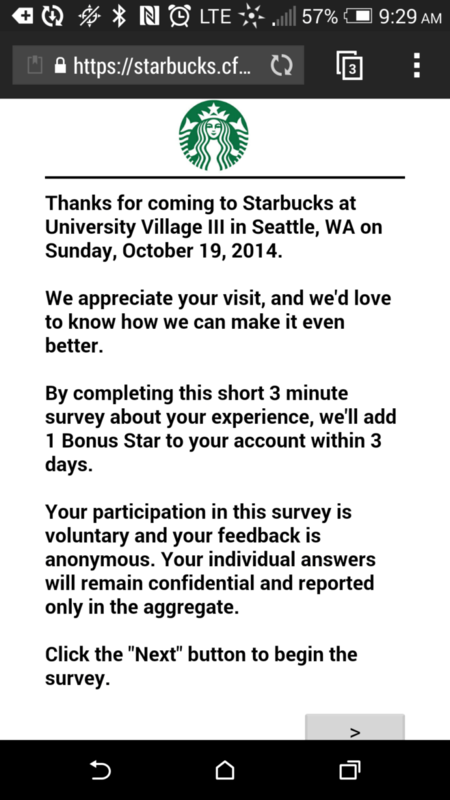 I received my first new survey invite yesterday for a Starbucks I visited in New York. Normally I would not complete the receipt survey, but the extra star incentive for the e-mail survey lured me in instantly. In that regard, the switch is a success, at least for me. 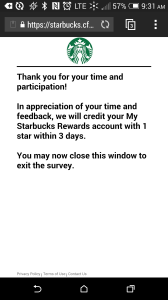 I have to believe though that these surveys are only sent to My Starbucks Rewards members because Starbucks would need an e-mail to contact the survey-taker. If a customer pays with cash (and probably credit/debit cards), there’s no linked e-mail address or contact information that Starbucks has access to to reach out to the customer. Also, I was asked very generally about my age on the survey (over 18 or under 18), so it seems like at least some of the demographic questions still exist. Hey Melody…I received a survey for my store where I am a partner…for a day I went in that i was not working. I was honest as I would be at any store. I would hope that any partners who receive the survey would be honest and not jeopardize the point of the program. I feel like partners should receive surveys-we are also ‘just’ customers from time to time…I find that most partners have integrity and since MSR IS the target demographic..why not? I got one of the surveys emailed to me last week. I hadn’t checked my email in a day or so. I imagine the survey was only about 24-48 hrs old and when I went to take it, it said it had been taken or something to that effect. So, I was unable to take it! I didn’t notice a specific expiration date or a strict 48 hrs. Did anyone else experience that? Overall, I like the changes. While I agree that we will miss out feedback from customers who are not MSR members, I do think it’s fair to assume that most customers who took the time to become MSR members are invested in Starbucks being a great experience, and will care enough to give honest feedback. When you factor in the fact that partners no longer have the ability to save receipts for regulars or toss receipts when an experience is less than satisfactory, I am feeling very optimistic that we will get better, more realistic scores for our stores. I have also received a survey, about my own store, and it is my partner card that is registered, so there’s no way that data is not known. I would guess that potentially Starbucks is measuring partner data separately from other customers – it would be interesting to know how a partner rated a store, and if the partner/customer experience in any given store matched up. We’ll be receiving more information about the new survey program in the next month or so, so I’ll be curious to know a little bit more, and see what the results are like! There are so many great comments here – I like the thought that if the score drops too low – So if someone selects something like 5 or less, there should be a box that pops up that says, “What could we have done better?” Who knows, maybe it does that now, but I wasn’t going to rate University Village 3 so low. Also think the comments about partners filling them out is interesting. Since there is no way for partners to know whom is getting surveys and partners are customers, maybe that will work. It’s just that if a store has 25 partners, and presumably each one pays with a registered partner card, there would be a lot of opportunity for each one to get one. One thing that would be interesting to know is how many surveys each store is getting a month! So many good comments. And I didn’t know that the survey times out after a short while. Melody, I just got one the other day. I was kind of surprised but gladly filled it out and my star reward appeared quickly. I don’t mind it at all! I hope they really use the information. Is it to see how each store is doing or is it to keep tabs on products and improvements? Its funny, I got this the other day after a store visit. I was annoyed that there wasn’t a response portion as my main issue with my store experience was the barista chatting with another partner who was off duty, slowing down drink handoffs and being rude. Otherwise, I really like the digital survey (Star reward aside), it was easy to fill out and submit. But…as a former partner and shift supervisor, the best part of the reviews was reading customer comments. I hope that Starbucks brings back the comments! Just got one of these today for a visit yesterday and the survey was even shorter than what you show in this post. It asked about 8 questions. I would have liked to be able to include comments as this was a different experience for me (I typically use drive thru but have not been happy with the experience at this location lately so went inside yesterday). I do like getting stars though, keeps me from having to keep a receipt with a code on it and remember to use it. As someone who rarely got the receipt surveys I like the email survey even though it is shorter. I hope they realize that the surveys will only be filled out by Star Rewards Members and they will not get the feedback from other customers unless the system tracks payment methods and gives surveys based on that. Starbucks needs to have a message on the website that the receipt surveys are no longer valid. Just got the survey at the drive thru. Strange that one of the questions was did the employee try to get to know me. Certainly not a fair question to ask about the partners for customer taking a quick trip through the drive through. More often than not I go into the store to order, but I have not gotten a survey for an in-store visit. I was wondering if the surveys are targeting certain stores or are randomly generated? 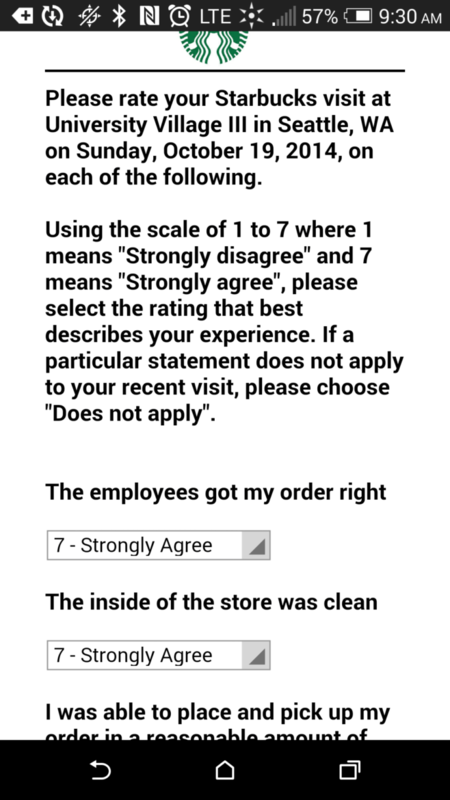 A friend also got a survey from the drive-through at the same store. @IzzyJ – Good point! Unless there’s no car behind you, the drive thru barista doesn’t have time much of any small talk. I’ve assumed that these surveys are random to MSR members. Though so far I’ve only gotten the one survey featured here. Came back from San Miguel de Allende (AWESOME STARBUCKS, WENT EVERY SINGLE DAY FOR TWO MONTHS!!!! )to Dallas. Cup and sleeve always aligned, people so nice, atmoshere has to be the most exquisite Starbucks anywhere. Monday am at Starbucks, Beltway asked for warm up of decaf (same cup, same coffee (only 1/3 drunk), same top just a hit (from the carafe like they gave me initially)(which kind of ticks me off because it’s like treating decaf drinkers like second class customers but I’ve gotten over it). DENNIS stepped in and was incredible, said he could make a special serving, gave me a choice of three choices of decaf, I chose the Sumatra for which he had to open a new bag. The experience went from utter disbelief on poor service to hero-worship. This Starbucks was totally without any comfortable chairs, none of the creature comforts one expects, really busy, has to be making money hand-over-fist. I too have received the same error message about the survey already being completed. However, it has happened to me EVERY time I have received a survey invitation email. And I’ve never taken longer than 24 hours to open the email and click the link – in fact, on more than one occasion, I clicked the link within ONE HOUR of the purchase (NOT the email, even!) and I STILL got the error message. I do not access my email from my phone, just from a browser on my computer, so maybe for some dumb reason that is causing a problem. Not happy about missing out on those free stars, either! 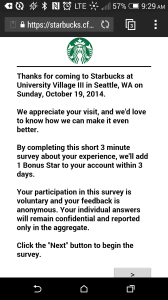 These Starbuck’s e-surveys DO NOT WORK. I cannot believe they have not gotten feedback about these errors yet. It has happened to me every time and I have tried opening them in ever browser possible. It’s ridiculous and annoying. I would like to leave the feedback they want and am ok with an online link, but come on, this thing is terrible. Mine is just a blank white screen always… never have worked…forget the experience…rate the e-mail! I would gladly take your survey if I could open it. I’ve tried several different ways of opening the survey but haven’t been able to. I think your I T Department needs some help. starbucks coffee is horibble!!! if you want a good cup of coffee, get one any size for $1 at McDonalds! You’re absolutely right. They need to revamp the survey system. CFMC needs help and Starbucks needs a new approach.